SONIC Drive-In Cheesy Bread Dogs And $15 Gift Card Giveaway! Fine Print: I was not compensated for this post. Sonic is giving a $15 Gift Card to a reader. All opinions and statements below are my own. If you love SONIC, you’re going to want to know about this new yumminess! There are new Cheesy Bread Dogs available and they sound good! “SONIC Drive-In announced the launch of their Cheesy Bread Dogs, a tasty twist on the traditional hot dog with cheese baked right onto the warm, soft hot dog bun. SONIC’s Ultimate Cheese and Bacon Cheesy Bread Dog and the Garlic Parmesan Cheesy Bread Dog are a cheese lover’s dream, adding to the already impressive lineup of hot dog options at America’s Favorite Drive-In! These sound so amazing and I’m looking forward to checking them out the next time I visit SONIC! 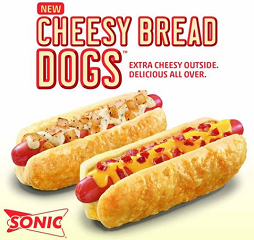 To get everyone excited about the new Cheesy Bread Dogs, I am giving one lucky winner a $15 SONIC Gift Card! To enter this giveaway, complete any or all of the options listed below. Giveaway ends 8/7. Good luck! Cheese & Bacon sound awesome! Can’t wait … I lovey sonic…. Garlic Parmesan Cheesy Bread Dog sounds best to me. The ultimate cheese and bacon one sounds the best to me. Garlic Parmesan sounds good to me. If I won I would take my little boy to eat his favorite food hotdogs and slushies!!!!! Garlic Parmesean for me too! I love Bacon, cheese and hot dogs., so why not the Bacon Cheesy Bread Dog. Yum!!! The The Garlic Parmesan Cheesy Bread Dog sounds good to me! Cheese & Bacon sound great! Cheese and bacon all around! I think the Garlic Parmesan Cheesy Bread Dog sounds best. I like the Garlic Parmesan Cheesy Bread Dog . The cheese and bacon sounds really good. I want to try the cheese & bacon hotdog. Cheese and bacon, two of my favorite things! Cheese and bacon sounds awesome! garlic parmesan and pass the mints! Garlic Parmesan Cheesy Bread sounds yummy. We’ve tried these and my grandson LOVES these. I like garlic and cheese so I would have to try the Garlic Parmesan Cheesy Bread dogs. I would like to try the Bacon Cheesy Bread Dog. I think the Garlic Parmesan Cheesy Bread Dog sounds really good. I think I would like the Garlic Parmesan Cheesy Bread Dog more. the Ultimate Cheese and Bacon Cheesy Bread Dog sounds delicious. I had the bacon cheesy dog and it was delicious! The Ultimate Cheese and Bacon Cheesy Bread Dog sounds so delicious. I think the Bacon Cheesy Bread Dog sounds good. the ultimate cheese and bacon! Love Sonic hotdogs…can’t wait to try the new ones! I would love to try the Garlic Parmesan Cheesy Bread Dog. Cheese and Bacon of course! I would like to try the garlic parmesan! I’d love to try the Garlic Parmesan dog. The Garlic Parmesan Cheesy Bread Dog is my favorite, but not by much because they both sound really good. Garlic Parmesan cheesy bread hot dog. Garlic Parmesan sounds the best to me! I want to try the cheese dog! Garlic Parmesan all the way! The the Bacon Cheesy Bread Dog is my favorite! The garlic parmesan sounds tasty.